Time definitely flies when you’re having fun. It flies even faster when that involves getting engaged, promoted, married and 15 pounds lighter. While I haven’t been writing, I’ve been digging right in and helping myself to the incredible changes life has served me. One of the most amazing things about the past few months has been the welcome with open arms from my new family. 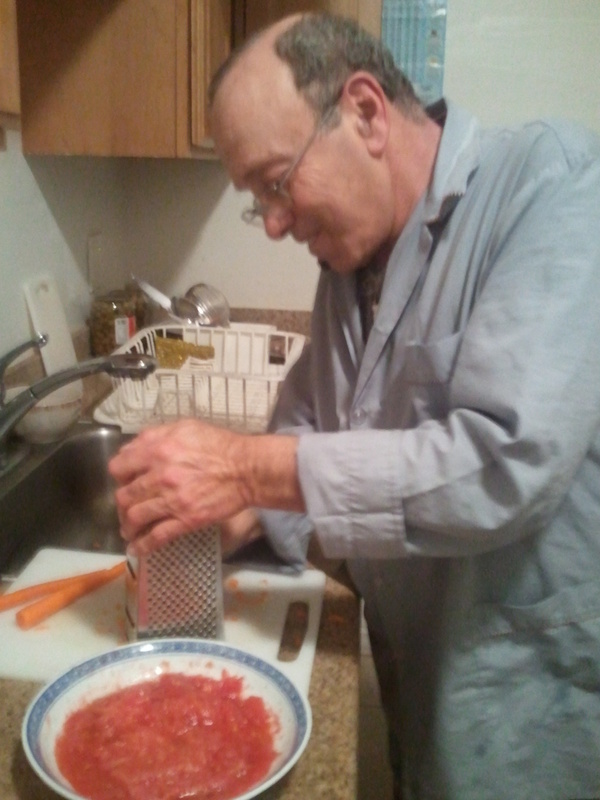 Lucky for my me, my husband and my faithful handful of dear readers, my amazing father-in-law lives just blocks away and has also welcomed me with an open kitchen. Since our wedding, I’ve had the pleasure of spending Sunday nights peering over his shoulder into a giant stockpot simmering with crackling olive oil, a generously fragrant fistful of minced garlic, fresh vegetables carried up from the farmers’ market and stewed lamb falling softly from its lovingly butchered bones. The cooking I’ve grown up with and so from which have felt most comfortable to experiment tends to involve a lot of “a la minute” sauteeing (clearly, I’ve been watching Top Chef while I plug away on PR plans this week). 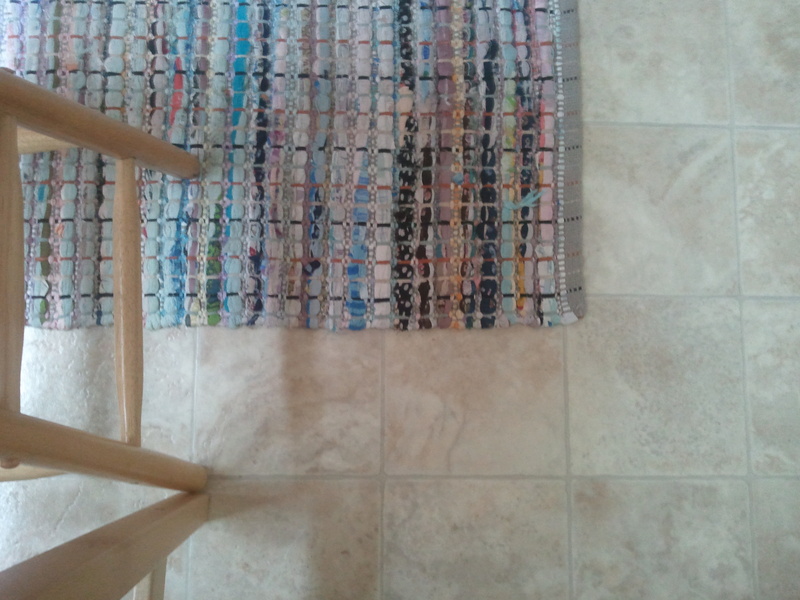 Watching my mom from across our granite counter at home, this coordination of colorful sides is casually but carefully timed. 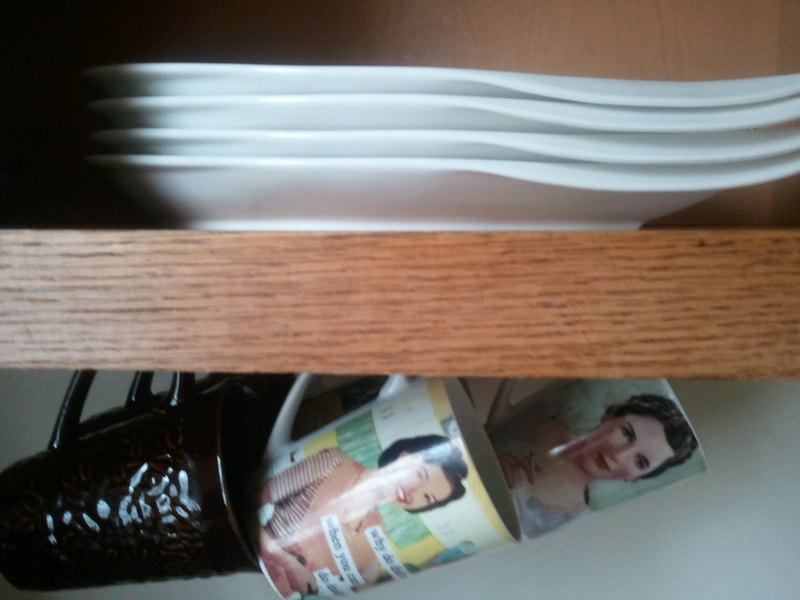 In my own closet of a kitchen, it’s frantic, leaving a trail of overturned prep bowls in its too-tiny wake. But the Middle Eastern cooking my Abuhamed has shown me is elegant, leisurely, leaving us time to put up our feet while the rice steams away, he smokes a forbidden cigarette and I try to memorize, fascinated, the lips of the characters on Arabic TV. 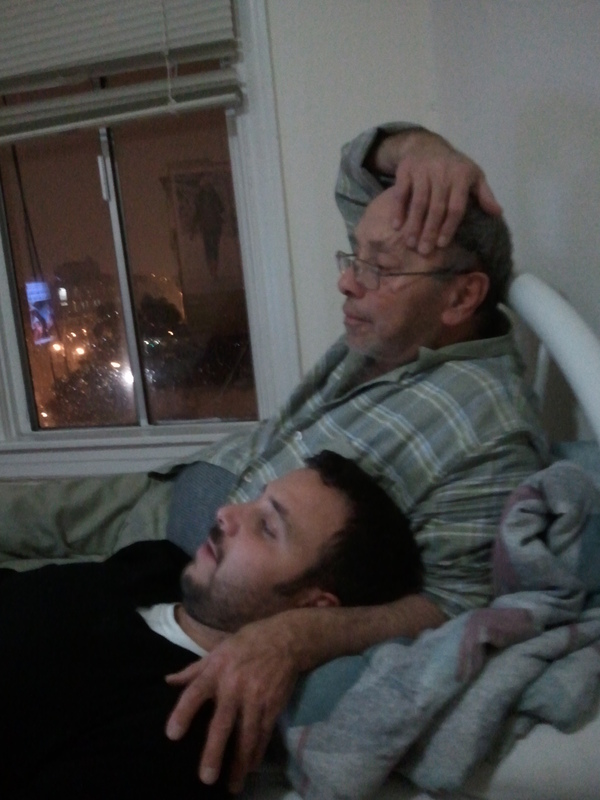 Moh and Baba "resting" while rice cooks. It’s clear where my husband’s love of food comes from. One of my first and most distinct memories of talking to Abuhamad (“father of Mohammad”) is the way he described the flavor of the olives from the trees where he grew up in Nablus in the West Bank, when you would wait all year for them to come into season. “There is no olive oil in the world that tastes like where I come from,” he said wistfully. I struggled not to tear up as I witnessed this gentle man recount such a visceral memory of a place he will never again see in his lifetime. Even if he were to return, it wouldn’t be to the place he describes as he skillfully slices onion after onion – one of simple people who never had much, but were content. One of the traditional dishes they ate there was “Mujaddara.” Some quick Googling reveals variations across the Middle East largely because it meets that universal jackpot of being delicious, healthy, filling, cheap and easy. Comprised primarily of ingredients you always have in your pantry – lentils, rice and cumin topped with onions and served alongside a quick salad of tomatoes, cucumber and lemon – mujaddara is comfort food at its simplest, guilt-free best. 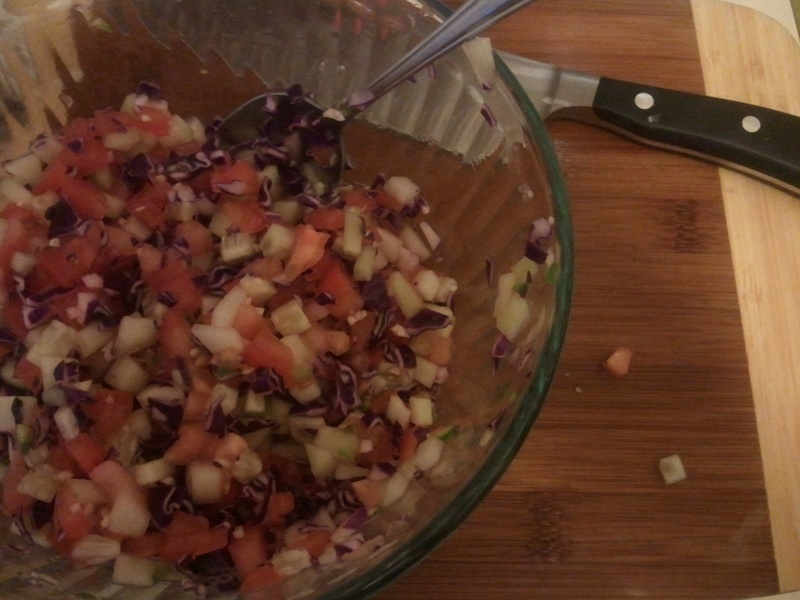 Diced veggie salad to accompany mujaddara. My camera phone photo is insulting to this dish. There’s a beautiful photo that looks like this version on Avocado Bravado. Wash lentils (no need to soak them). Pick out and get ride of the uglies. Put lentils in a big stockpot and cover them with water. Bring to a boil and cook for about 5 – 7 minutes after it does so; you want the lentils to be just barely cooked, but it’s important that they not get soft yet or they’ll be mushy later. Rinse rice and add to the pot. Adjust water level so it’s where you’d want it if you were cooking rice – just covering it by about a half inch. You might have to add a little water, you might have to scoop some out. Stir everything. Add a generous pinch (or a small spoonful) of salt. Just like you would with rice, bring to a boil over highish heat, then cover and bring to a low simmer until rice is cooked. Meanwhile, slice onion into thin strips. If serving traditionally/not calorie consciously, fry the onion in corn or canola oil over high heat and dry on paper towels. Or, for my Weight Watchers friendly variation, caramelize the onions. I like to start them in a teaspoon or two of olive oil over fairly high heat, then bring them down to low and cover, stirring occasionally. Let them go until the rice is done. Prepare the salad. Dice tomatoes, cucumber and whatever else you’re using. If you like heat, cut off the top of the jalapeño and get rid of the seeds and ribbons. Dice into tiny pieces. Add all or part, depending on how spicy it is (and you are). Squeeze juice of a lemon over the top, toss with a small amount of olive oil, and S&P. Serve mujaddara with the onions on top, alongside the salad and yogurt. Fresh diced veggie salad to accompany mujaddara. Moving. The very word evokes groans, sympathy, shudders, headaches. The curse of being an urbanite in your twenties seems to be that you’ll pack the crap you somehow managed to amass in a seemingly tiny amount of time on a seemingly tiny budget into cardboard liquor boxes with the same frequency you blow out birthday candles. Until now, I’ve avoided the dreaded repack by avoiding the unpack.This time around, bolstered by immersion in Apartment Therapy and Philz Coffee, I’ve decided to turn my shoebox studio into a home. Yes, I meant that literally... thank you, artist formerly known as Murphy bed. 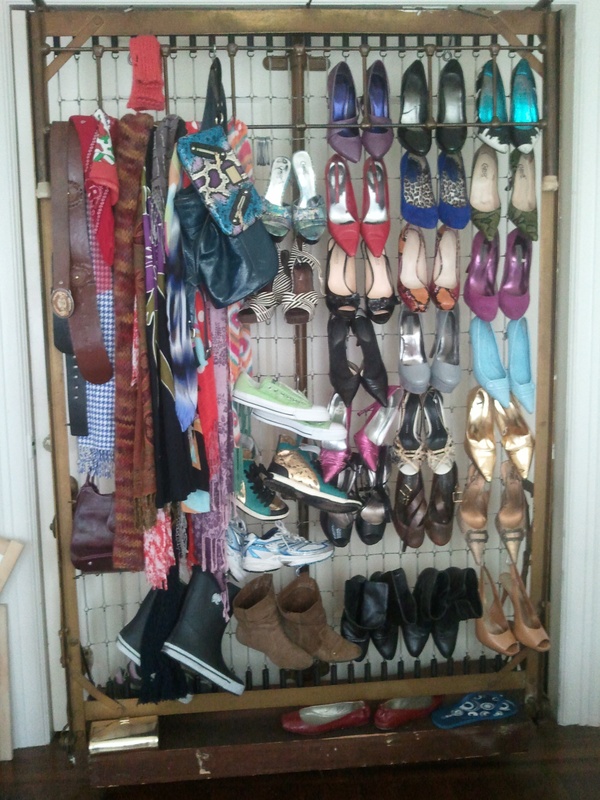 For me, the heart of any home is its kitchen (though clearly, I started with the sole of this one). So, I’ve spent the last month’s worth of weekends trekking down the hill from my new Nob Hill pad (happily Muni pass-free), tossing the ingredients of a well-stocked life into a series of SF-approved reusable bags as I go. And because whether you’re just moving in or already thinking of moving out there’s nothing like a little something new to spice up the domestic routine, here are the five essential Sunday shopping stops to make you feel truly settled into your humble abode. Heart of the City Farmers Market: I love this place as much for the unassuming way it takes the snobbery out of Northern California produce as for the cheap heaps of berries, squashes and greens themselves. Nestled between the glistening grime of the Tenderloin and the graffitied glory of mid-Market Street, I can only imagine the characters HOTC has fed over its 30+ years, more colorful even than the $1 afternoon bunches of cheerful carnations. Visit with a travel mug of home-brewed Philz and breathe in the smells of artisan olive oils mingled with the stench of dirty it’s-clear-what rising off a heated Market Street sidewalk, and you know you’ve truly arrived in San Francisco. Kamei Restaurant Supply: I’ve quickly grown to love the minimalism required by studio life. Economy of space not exactly being an American virtue, traditional sources like Target have turned out to be severely lacking when it comes to getting more out of less stuff. It’s the Chinese to the rescue, with wares from an ingenious double-decker drying rack to beautiful bamboo cutting boards on hooks to immaculate bone china in asymmetrical cuts and hand-painted patterns. 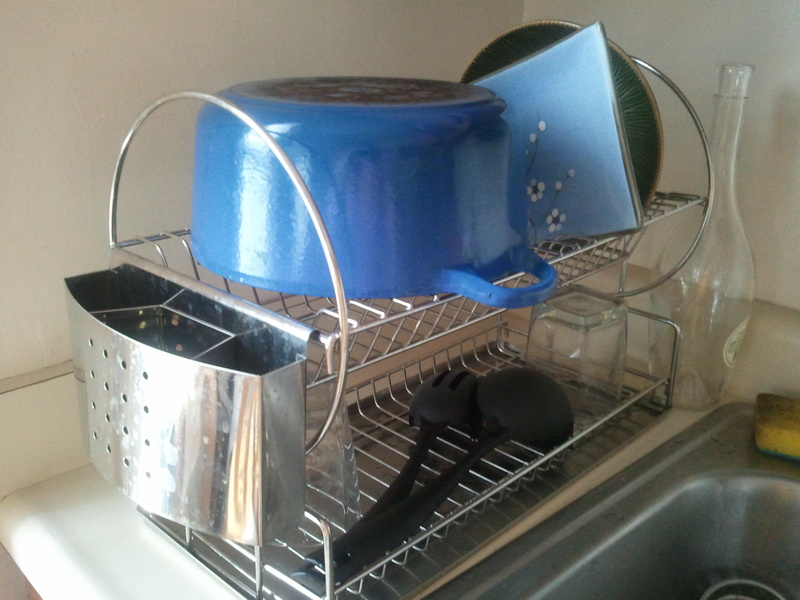 A dishrack as silly as it is sensible. Clearly, after my own heart. The Container Store: OK I’m caught, despite my righteous Target-bashing I am a huge fan of certain purely American indulgences, this evidently Texas-based, mid-box establishment being one of them. 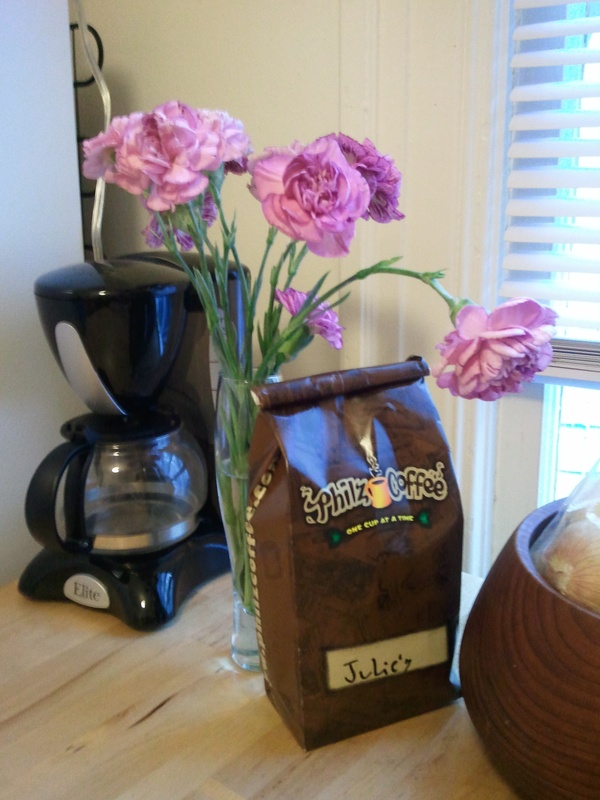 Where else can you create a make-your-own-spice-rack or find a sliding plastic mug-hanger? Never fear, when the fabulosuly bespectacled employees start to recognize you on your third trip in as many weeks, they judge not but instead see a kindred spirit drawn to this homeware oasis tucked illogically smack in the middle of Powell Street tourist madness. Who doesn't love a mug on a mug? The bargain bins: My life-long love affair with cheap shopping is genetic. More than one family member cried when Caldor went out of business. Yes, I wish I was kidding too. While I’ve long been acquainted with TJ Maxx and Marshalls, Ross, with a kitchen department that puts Sur La Table to bloated-price-tag shame, is a new West Coast fling. These are the spots to scour for all things Cuisinart and Kitchenaid. Who says you can’t be a price-conscious brand snob? You can take the girl out of Connecticut, but you can't take the rag rug out of the girl. 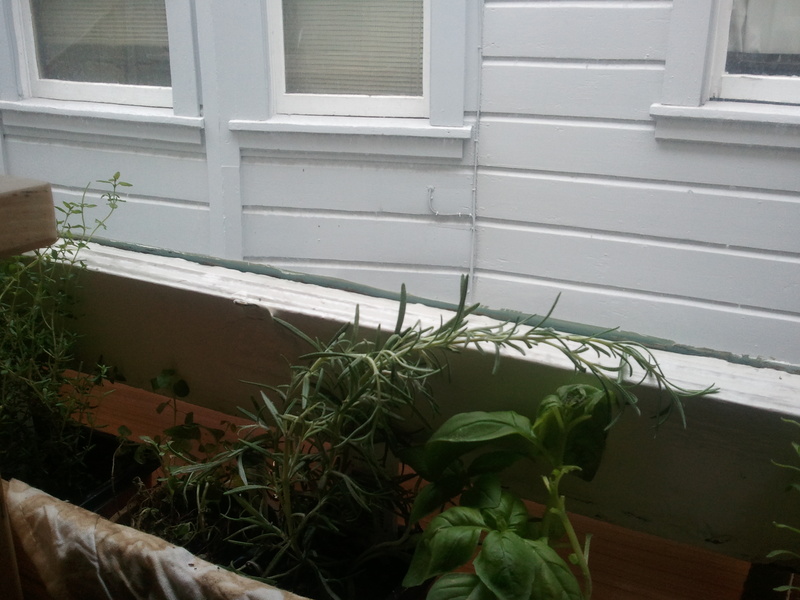 Sunfat Seafood Co.: When Moh saw what I was willing to fork over at my new local hardware store for things like S-hooks (to hang my shoes, obviously), he decided it was time to introduce me to the Mission Street dollar store row. Giant plastic bags full of 40 necessities for $40 later, we were ready to cash in on the rewards of our sensical spree… and found ourselves conveniently (ok I planned it) across the street from Sunfat Seafood. Browsing bins of 30 different kinds of oysters with names as varied as their rainbow shells of briny sea blues, greens and purples, there is no better way to remember that all this shopping is just a means to an end – breaking in your new kitchen with your first home-cooked meal. If you’re as lucky as I am, it’s an end filled with seafood and Sofia rose. 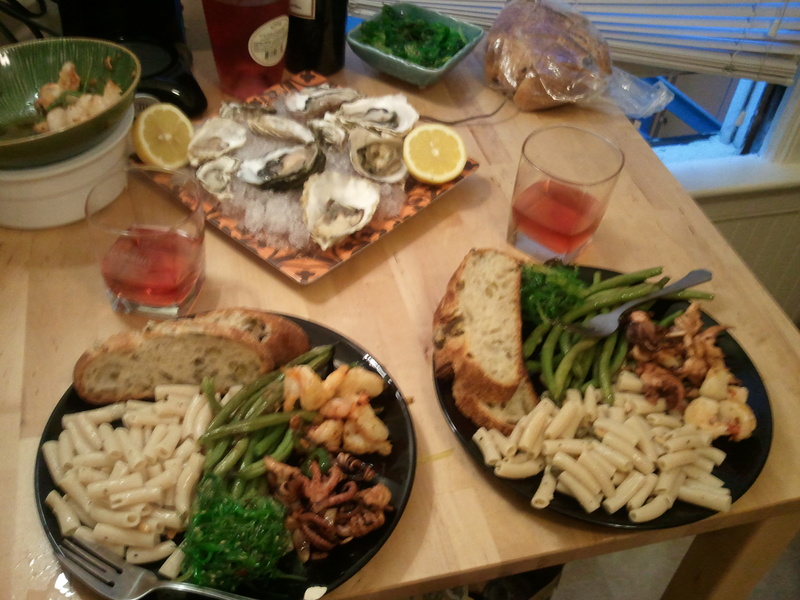 So delicious we barely noticed we had to eat standing up because I didn't have stools yet. Very European, no?